I traveled to Baton Rouge, Louisiana with Ginghamsburg's creative duo of Dan Bracken and Greg Gerken to capture the story of The Flood. This film was shown to help inspire the church. The Ginghamsburg's 2016 Christmas Miracle Offering collected a total $585,000. Of that, a total of $116,000 was given to the Louisiana Conference of The United Methodist Church. Along with the financial gift, they have started sending mission teams to help with the recovery and restoration. 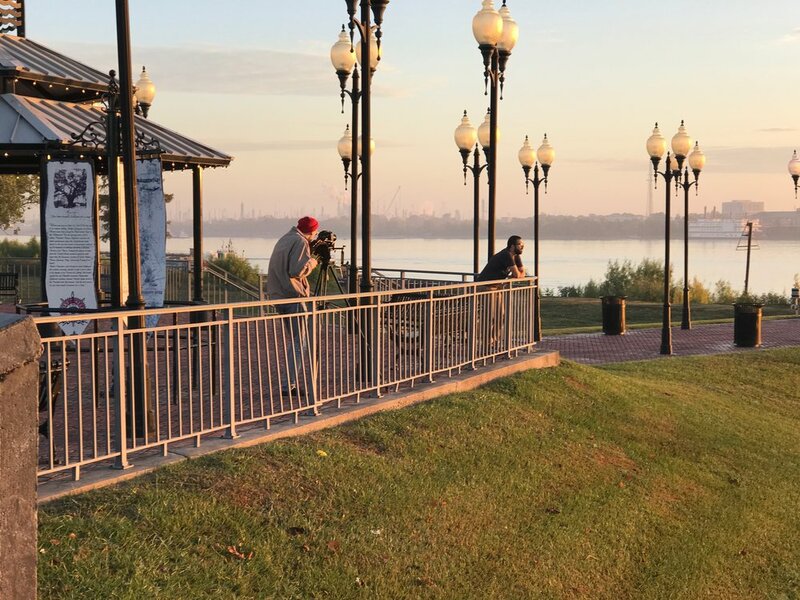 Greg Gerken filmed this humorous short clip while we were setting up to film the sunrise time-lapse of the Baton Rouge skyline. Capturing time-lapse on the west bank of the Mississippi River of the Baton Rouge skyline at sunrise. We're filming in the gutted house of Bill, a flood survivor. Bishop Harvey shares how not only the local churches but churches from around the country responded to help flood victoms. Ms. Emma shares her story of rescue and recovery. This was a challenging location to film. 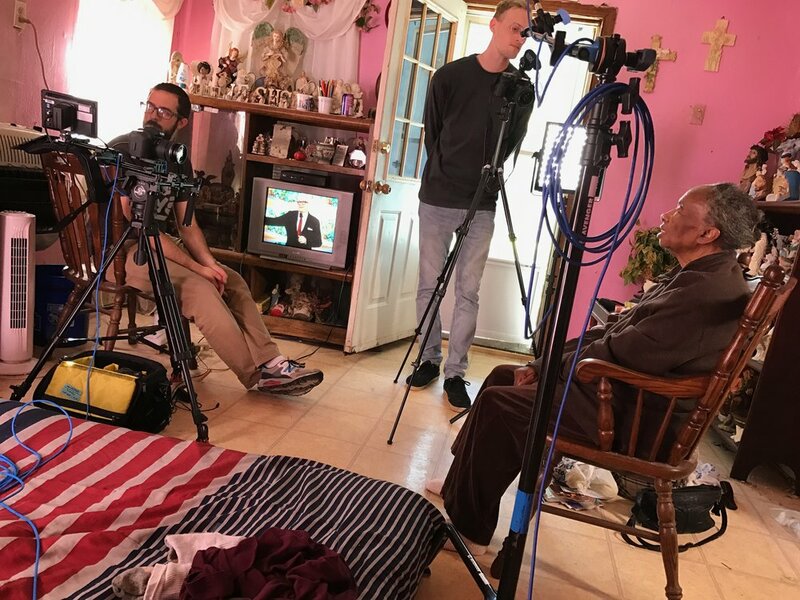 Ms. Emma shares a very modest home with her teenaged grandson and daughter. It's located in a rural area of Livingston Parish. There are still two rooms that had toxic black mold. As you can see we are filming in the living room and there is a mattress on the floor. We had to leave the TV on because it was broken and is very difficult to turn back on. We have to work with what we have. Greg Greken films Dan Bracken for a shot in the opening sequence. Getting back-ground story elements about the Floor and an surprising twist that expanded the story. We are filming in the State Police Emergency Crisis Command Center in Baton Rouge. Unfortunately, it wasn't as cool as Hollywood leads us to believe. Shot of my audio kit while filming Colonel Mike Edmonson of the Louisiana State Police. We are filming in the State Police Emergency Crisis Command Center in Baton Rouge. Todd Rossnagel, Director of Communications for the Louisiana Conference secured this drone footage of the dump site. The debris mounds were more than double this size at the height of the removal process. You'll see rows of school buses, as we understand it, they all were completely under water. It will be to costly to salvage/repair them. So they will be disassemble for scrap. B-Roll at one of the two temporary dump sites. This is just one of the two temporary dump sites of all the debris removed from the flooded areas. Anything that could be recycled was removed before the remaining debris was dumped here. From here trucks will take the material to permanent hazardous waste site. As you can guess, the smell is horrible. Greg and Dan are filming other angles around the site. Something we don't think about when flooding happens are the cemeteries. South Louisiana has a high water table so graves are often only 75% buried underground and the lid lies above ground. When water is over the top of the grave for extended periods of time, the pressure causes the grave to either pop the lid or float the entire vault. Since the graves have been disturbed, the coroner's staff have to visit each cemetery in the affected area and identify the remains before they can be returned to their resting place. I can't imaging how upsetting this is the families.